I have received a lot of questions about my new video called "Flying over San Francisco", People want to know how I shot it, how the camera stayed so steady, what technology I used, and the legality of shooting in these locations. So...I am writing this blog entry to answer your questions and tell you how I made the video. All of this started a couple of weeks ago, just after I returned from shooting in Sardinia. I was spending a lot of time in San Francisco, since my daughter was staying in the hospital there. One afternoon, while my daughter was resting, my wife (who had been staying for almost a week in the hospital with my daughter) really needed to get out for a little bit, so we drove over to the Golden Gate Bridge. 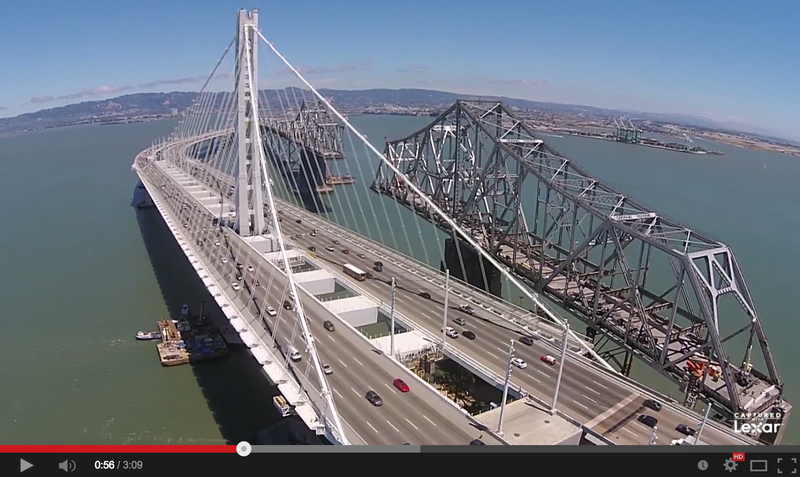 I had the DJI Phantom 2 Vision+ in the trunk of my car and I really wanted to fly by the bridge. We parked at the base of the bridge, I powered everything up, and sent the flying camera up and away. The winds were howling and my wife looked at me like I was crazy. Once the Phantom was in the air and hovering near the bridge, I looked down at my iPhone (which gives me a realtime view of what the camera on the Phantom is seeing) and it was obvious that the motorized gimbal could handle the movement. I was totally amazed at what I saw on the screen! I captured 9 or 10 different video clips and a bunch of still images from different angles, and then brought the Phantom back to me. Once I got back to the hospital, I downloaded everything. My wife, daughter and even some of the hospital staff were all impressed with the unique perspective of the video. At that point, I was inspired to get more footage. Over the last couple of weeks, I continued to make trips to San Francisco (about an hour from where I live) to shoot video of my favorite spots in San Francisco. Knowing what this device could do, I set out to try and get different views of the city. At the same time, I was also careful to fly safe and legal. Right now, it seems like the rules are all grey, with the technology being way ahead of the law. But from what I read on the Internet, I needed to stay under 400 foot altitude and away from heavily congested areas. But, as you will see from other video clips, I did fly over people, but stayed away from "heavy congestion". I kept thinking, "what constitutes heavy congestion, vs. people in the area." During my second trip to SF, I wanted to go and shoot more video of the Golden Gate Bridge, but from the north side, facing back to the city. As I drove across the Bay Bridge, I looked west to see that the Golden Gate Bridge was completely covered in fog. That wasn't going to happen. But, since it was perfectly clear at the Bay Bridge, and this was a rare time to see both the new segment and the dismantling of the old segment, I decided that this would be my first stop. I got off at Treasure Island, which exists in the middle of the two spans of the Bay Bridge. I flew the Phantom towards the bridge from a distant location and decided that it was just too far away. I wanted to keep the Phantom in my vision while shooting the video. So, after driving around the small island for a while, I found a closer location where I could launch the flying camera and see it the whole time. This sequence was pretty easy to shoot, since the Phantom maintained it's position, using GPS, and I just had to pan while in place. Honestly, the hardest part was using the controls to do a slow and steady pan, without any jerky motions. This took numerous tries to get a useable clip. Once I knew that I had good footage from the Oakland side of the bridge, I moved to the other side of the island to get video and stills of the San Francisco span of the bridge. But after a lot of searching, I determined that there was no close and clear view of the bridge from that side. I found a parking spot on the southwest side of the island, and launched the Phantom straight up to determine the quality of the view. I was happy to see that the bridge was close by and at a nice angle from me. It was on one of these exploratory flights that I came up with the idea for this sequence. 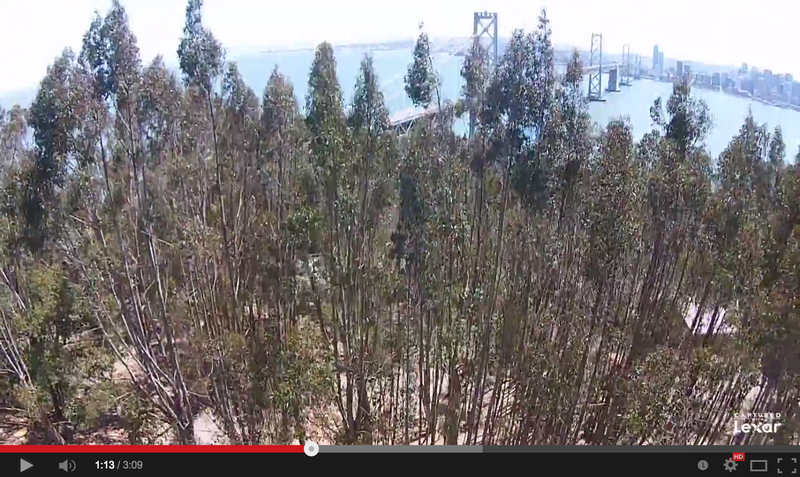 I pointed the camera straight towards the trees and sent the Phantom 2 Vision+ straight up in a slow and steady rise. You will notice a little bit of left/right motion as I get past the tree level. That was from the winds, which increased once I was over the tree cover. I tried this shot many times, but could never avoid that wind change. This middle sequence was actually the last one that I took. I was just about done editing the video (using Apple's iMovie), when I felt that something was missing. 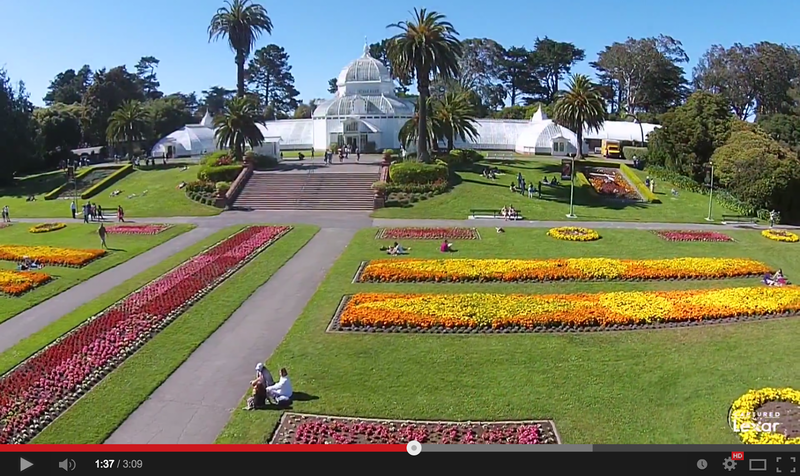 I really wanted to include a shot with the colors of the Conservatory of Flowers in Golden Gate Park. Since my daughter had another procedure at UCSF, and we were heading back to the city once again, I packed the Phantom for this one last shot. As it turned out, the weather was really nice on Saturday, giving me a great shot of the park. Since this was a weekend in Golden Gate Park, and the height of tourist season, there were a lot of people at the Conservatory. I have flown the Phantom quite a bit for the last month, and feel confident in my abilities. I was a little worried, not about safety as much as the noise of the Phantom disturbing people. (For those who have not heard one, they sound like a loud cluster of bees). Like almost everywhere else I have flown this, I turned out to be the attraction as opposed to the distraction. Lots of people were coming up to me, wanting to see the display, and astounded at what I was capturing. And lots and lots of questions. The most common questions were "how long does the battery last?" and "how far away can it be flown?" As for the answer to the last question, The farthest that I have flown was 2300 feet away, and then it lost connection to the controller. This happened over the ocean in Sardinia, Italy. And the best part is, when the Phantom loses connection, it uses GPS and flies itself home to where it took off. Brilliant!!! I have had this happen 5 or 6 times now and it works amazingly well. They even tell people that if you lose site of the device, to turn off the controller and let the Phantom bring itself back. I was teaching at a camera store in San Francisco one evening last week, and left home early to make a couple more stops in the city. 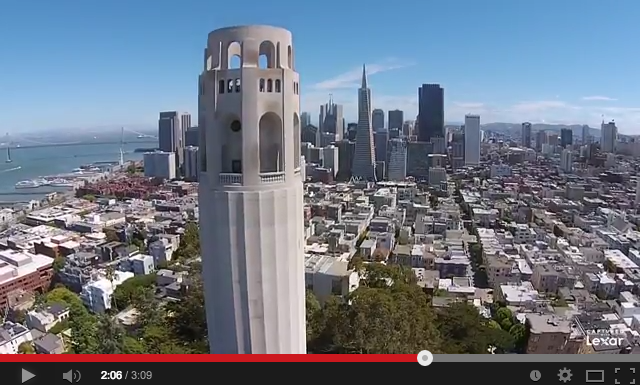 This time I went to Coit Tower, to try and get some shots from high above San Francisco. Just like the tree shot, I pointed the camera directly at Coit Tower and did a slow climb, eventually going above the tower and seeing just the city. Once I had the "climb" shot completed, I switched batteries and sent the Phantom up once again for some different views. One of the harder maneuvers for a new "pilot" is flying around something while pointing at the subject. I am still not great at this, but managed to get a useable sequence for the video, and actually once that I am pretty happy with. 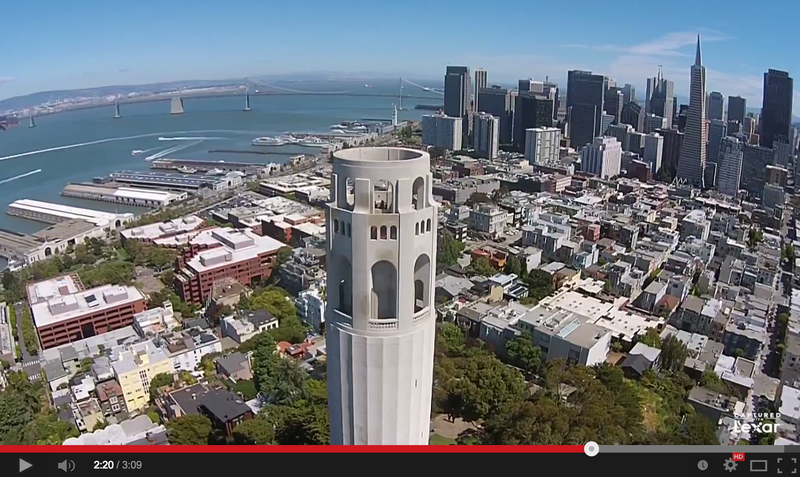 What a beautiful view of San Francisco from this altitude! 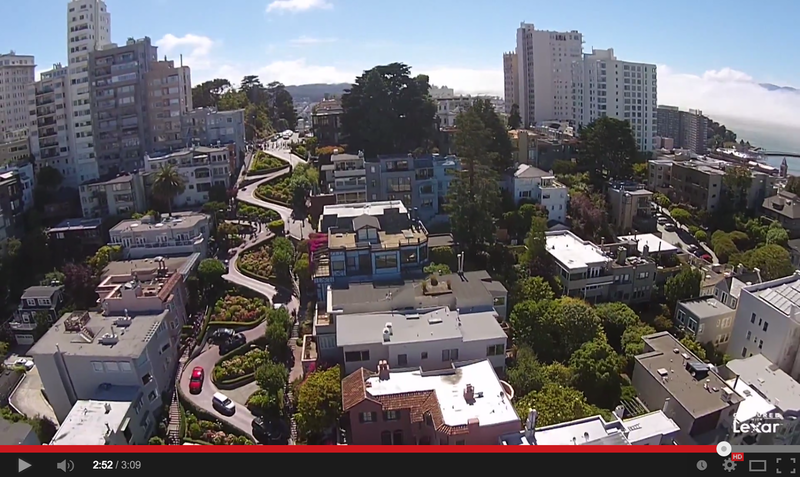 The closing shot of the video, was taken at Lombard Street, otherwise known as the "crookedest street in the world". I was standing at the bottom of the hill, so that I could get a good perspective, and see the height of the Phantom. I did numerous passes up and down the street, both at low and high altitudes. 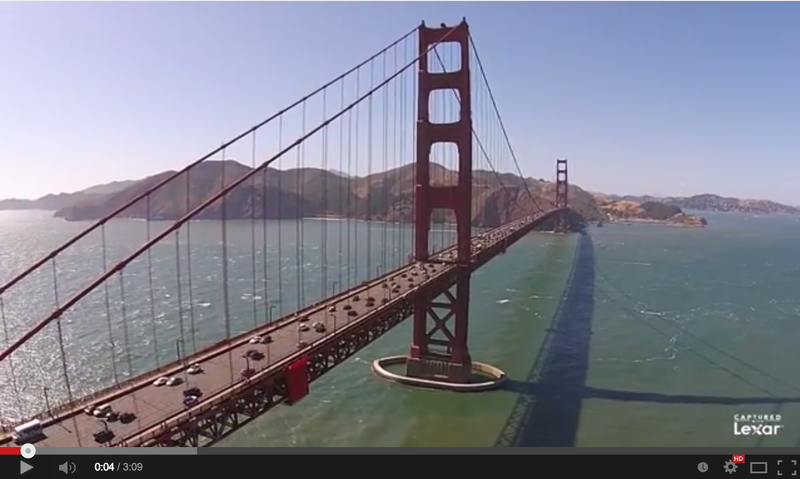 I figured that I could not have a video of San Francisco without this famous tourist attraction. The last shot was fairly simple, with me maintaining the Phantom's altitude and just backing away from the street. I like the way that it shows the details of Lombard street with a context of the surrounding buildings. Oh yeah, one other question I get a lot is "How much does that cost?" When I tell people that it costs $1299, the next question is usually, "How much is the camera?" When I tell them that the $1299 price includes everything (other than the mobile phone I am using to remotely view the camera), they are pretty impressed. I look at the Phantom as something that costs half of what many of my lenses cost, and it lets me get photos that are impossible with any other camera or lens. And, flying this thing is a whole lot more fun than using a traditional camera. As I mentioned, I did all the editing in Apple's iMovie, mainly cutting down the clips and merging just the best sequences. I then purchased the music from AudioJungle and voila! If you want to try one of these yourself, here are the links to what I used. And stay up-to-date with all my photos and videos on my Facebook page. I really hope the manufacturer reimburses your purchase for all the promotion you've been giving them. I'm sure they've picked up a few new customers as a result. I know it's been added to my wish list, especially since it's almost half the cost of some of the lenses I've been looking at. the problem I have is finding someone to teach me how to use it. As a small plane pilot who regularly takes people for sightseeing trips around the Golden Gate I find this all rather disturbing. I am on ATC radar and in contact with an air traffic controller, your camera rig is not. AJK - Are you flying your plane below 400 feet???? I'm not an expert but I have been looking at what people are doing with these for a while. It is great to see that a well know photographer is sharing his experiences. Jeff great post. I am flying the Phantom 2 Vision + as well and love it. Often I read the photo quality is not as good as a pro camera, true to some respect, but the wow factor from a shot 300 ft high more than makes up for it. Awesome post, Thanks for share nice. Yeehaw - This was my first Rodeo!! !